We've always loved great breakfasts in our home. The thing is, however, they rarely get served up before noon. Occasionally we'll make a big brunch of breakfast items but, more often than not, we eat these "breakfasts" as a late lunch or dinner. I admit that we are kind of funny when it comes to messing with our morning Oatmeal Ritual, but this isn't the only reason for our little scheduling issue. We like to be able to sit and savor a great breakfast...and most mornings simply don't offer this luxury. I ran across this idea for a fluffy egg scramble on one of my favorite blogs, Sunday-Suppers, which is based in New York and recently featured an egg scramble from a local restaurant they visited. I'm thinking that the particular scramble they referenced might have been made with egg whites. Being on the opposite coast with no plans to get to NYC any time soon, I decided to attempt my own version. I happened to make my little tester dish using three egg whites and one yolk and I think this 3:1 ratio worked really well. (You can certainly omit the yolk and I think it would be just as yummy.) I also incorporated some herbed chévre cheese into the eggs which was especially tasty...adding not only to the overall flavor but to its great fluffy volume as well. And then there's the sautéed mushrooms!!! I'm really not an impartial judge when it comes to sautéed mushrooms, believing that they'd be good on pretty much anything. But here...they are great! They add a wonderful, earthy, meaty flavor to the scramble...rounding it out beautifully. And...when you load all this onto a thick slice of whole grain bread that you've lightly toasted in the oven, then sprinkle it with a touch of fresh, chopped flat-leaf parsley...well, it's just plain GOOD. I could have easily stopped here and been entirely happy with this dish. However, I had some leftover lacinato kale and remembered a recipe I had run across not too long ago. I never clipped it as it was a pretty simple sauté...just kale, red onion, garlic, and toasted pine nuts. It's a great, healthy, flavorful side to this scramble. 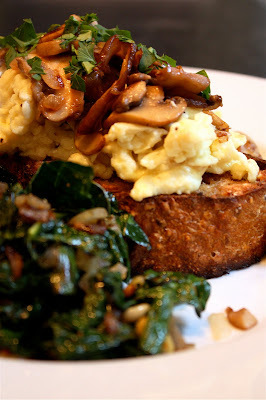 It's so good I even toyed with the idea of placing the kale right on the bread and then topping it with the eggs and mushrooms...but I refrained. However you choose to plate this dish up, the combination really works. The eggs are extra light, airy, and fluffy...with a subtle hint of chévre peeking through. The mushrooms are delectable (no surprise!). 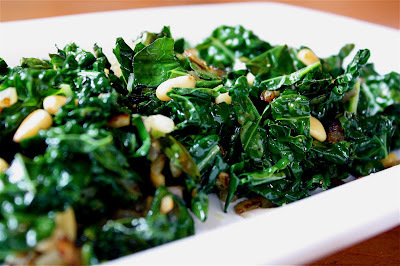 And the quick sauté of kale could not be easier or better matched for a healthy side that offers just a sliver of sweetness in the caramelized onion and toasted pine nuts. 1. Begin with mushrooms: Heat 2 tablespoons unsalted butter and 1 tablespoon olive oil in a skillet over medium-high heat and add sliced red onion. Sauté for 3 to 4 minutes, until onions are soft. Add sliced mushrooms and continue to sauté, turning often, until mushrooms are lightly browned...about 4 or 5 minutes. Season with salt and pepper, to taste. Cover and set aside. 2. Heat oven to 375 degrees F and place bread on baking sheet. Set aside. 3. 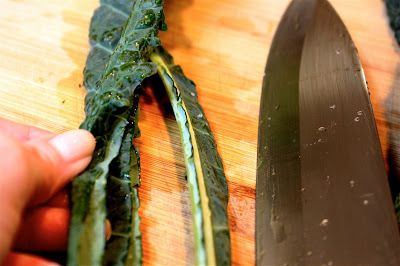 Begin kale: Remove hard stems of kale by simply folding leaf in half and cutting "spine" out. Heat olive oil in a large skillet over medium-high heat. Add red onion and garlic and sauté until onion is soft and slightly caramelized...about 4 to 5 minutes. 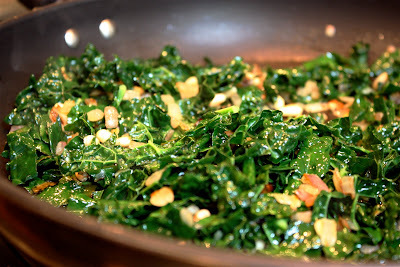 Add sliced kale to skillet and sauté until kale begins to wilt but retains its deep green color...about 4 to 6 minutes. Add salt and pepper, to taste. Add toasted pine nuts to kale and heat through. Cover and set aside. 4. Begin eggs: Place egg whites in one bowl, and yolk in another. 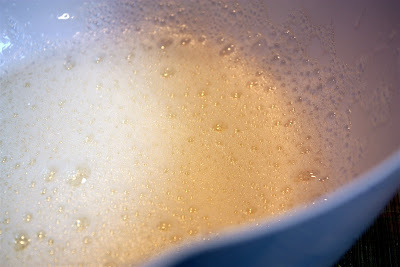 Lightly whisk whites until they thicken a bit and get foamy. Separately whisk egg yolk and then fold into whites. Heat 2 tablespoons butter in a skillet over medium heat. 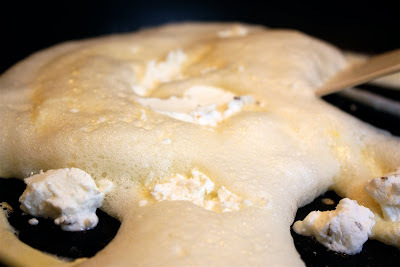 Add egg mixture to skillet, drop dollops of chévre on top, and turn egg mixture as you would with any traditional scramble. Pop your bread in the oven and watch closely so that it toasts very lightly...just a few minutes. (if you prefer to broil it lightly...you can do that as well.) Continue turning your eggs. They will look a bit foamy at first but they come together quickly...though fluffier and more airy than traditional scrambled eggs. Season with salt and pepper, to taste. Remove eggs from heat ...and bread from oven. 5. 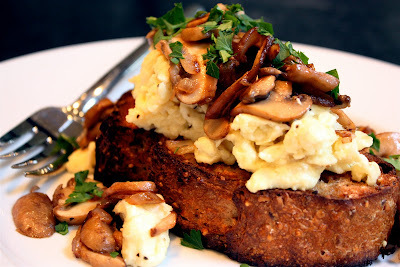 Place slice of bread on plate and top with eggs, then mushrooms. Sprinkle chopped fresh parsley over top. Serve with sautéed kale. Note: you'll have a little kale and mushrooms left over, using the portions recommended...but not much.